The industrial business community now has a higher level of engagement in new permit applications, and in advocating for environmental protections in industrial areas. Hume City Council has recently implemented a stormwater pollution education program called Cleaner Creeks, Everyone’s Business. As part of this program, Council officers visited businesses in targeted industrial areas to discuss site management practices and the impact of polluted stormwater on the Merri Creek. Initially, this program focused on four industrial estate areas in Campbellfield and Craigieburn. These areas were identified as a potential high pollution risk given the high number of auto wreckers and materials recyclers on site. Common sources of pollution from these industries include solvents, heavy metals, fuels, oil and grease. This education and awareness program will be extended to three additional areas in 2017 and 2018. Consulted with business owners about changes in site management practices that would improve the quality of stormwater run-off discharged to Merri Creek. The project also involved periodic sampling of 10 stormwater drains and three creek outfalls within the industrial areas, to test for heavy metals and hydrocarbons. This occurred prior to, during and after educational visits. This data provided a baseline water quality measurement in the industrial areas, and a means to assess the impact of the face-to-face sessions on water quality improvement. 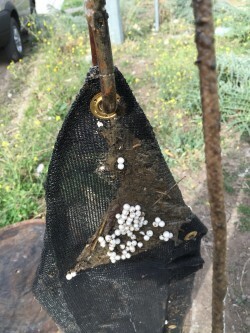 Initial sampling, which occurred prior to the commencement of education, found that extreme levels of arsenic, copper, chromium, lead and Total Petroleum Hydrocarbons were entering the Merri Creek. A reduction in the concentrations of some pollutants (nickel, chromium, zinc and copper) was evident as the monitoring and educational visits progressed. Hume City Council’s Integrated Water Management Plan which outlines a commitment to provide water education to communities in the municipality, including a focus on industry and pollution hotspots. 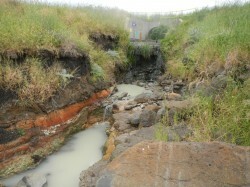 Recent waterway pollution events in the municipality have highlighted the need for industrial site management education. 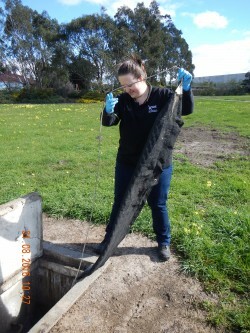 The Cleaner Creeks program, which was inspired by a similar project in the Thomastown industrial estate (City of Whittlesea), where improvements in stormwater quality were achieved following educational engagement. A waterway improvement plan written for Melbourne Water and Yarra Valley Water, which highlighted water quality issues in the Merri Creek, and identified stormwater quality improvement as a priority. The project sought to complement the implementation of Clause 22.19 of the Hume Planning Scheme – ‘Industrial Stormwater Management Policy’ – which was adopted into the Scheme in December 2012. Clause 22.19 requires new industrial uses and developments to adhere to stormwater quality improvement objectives. Because the municipality also includes established industrial developments which were not subject to the requirements of this clause, the Cleaner Creeks program complements this planning control. The Council education program was linked to improvements in stormwater quality over the monitoring period, with benefits expected for local receiving aquatic ecosystems. Broader amenity improvements were achieved through collaboration with other teams within Council, including Planning Enforcement, Local Laws and Waste. For example, dumped waste and vehicle wrecks were removed from the area with support from residents. Collaboration has increased between Hume City Council and other Councils with large industrial estates like the City of Whittlesea and the City of Greater Dandenong. As a result, knowledge sharing has increased, and there is increased opportunity for improving stakeholder engagement and stormwater management across the region. The education program also gave the industrial community the opportunity to raise wider precinct-scale concerns with a representative from Council. The development of flyers which show site remediation and pollution prevention products like spill kits and sediment filters may improve the uptake of solutions. It is essential to complement the distribution of flyers with face-to-face communication. This enables the information to be tailored to individual sites and business activities. Some business owners noted that the generic examples of acceptable and unacceptable site management practices in the flyers did not exactly match their business context. Council officers were then able to explain in person how the information is relevant to each business type. Industry-specific flyers may also assist to resolve this issue and improve engagement. Face-to-face education is an effective way to engage the industrial community and provide information, as opposed to formal training sessions in a classroom setting. Many small businesses don’t have time to interrupt business activities and send staff to formal training sessions. Conducting a less formal on-site education session ensures that information is tailored to the business, and that specific precinct-scale concerns can be addressed. The face-to-face approach also allows a continued site visit program to be incorporated into business-as-usual activities of the Planning and/or Environment departments. Education sessions and flyers alone may not always result in businesses committing to better site management. In some cases, follow-up enforcement is required to achieve compliance. Enforcement activities were undertaken by Council’s Planning Enforcement team and Local Laws team. Planning policy that requires best practice industrial stormwater management for new businesses is important to protect in-stream water quality. Collaboration with other teams within Council, other municipalities, and other agencies improves outcomes. Cleaner Creeks has facilitated involvement from a wide range of Council departments, including Planning Enforcement, Waste, Local Laws, Statutory Planning, Engineering and Research. This ensures that a range of educational and remediation activities can be implemented.